“Risk” is a word of extremes. So often you hear about people risking their health, their money, even their lives. 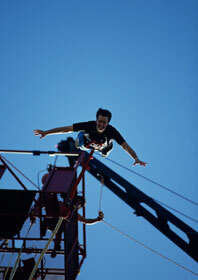 But risk taking—though a departure from the norm—doesn’t have to be all bungee jumps and gambles. Taking risks in life can lead to great rewards, and the process of simply breaking out of one’s comfort zone can lead to immense personal growth. And to be risk averse . . . well, that might be the riskiest thing of all. In order to build success, to stand out in the everyday environment, a person must reach beyond and try new things, Cohen says. During a recession or otherwise less-than-awesome job search environment, that imperative is greater than ever. Swarms of intelligent, accomplished people vie for the same pool of jobs, many going without them, because they can’t differentiate themselves from their peers. Taking a risk can be a means to that end, whether it’s just reaching out to new people or submitting an unconventional résumé. Risk taking can’t exist on its own; that blind ambition needs to be paired with drive and determination. Sure, it means leading a more challenging life, being a little uncomfortable, being a little afraid, but these are the “symptoms of risk,” Cohen says. He encourages college students and grads to be courageous in their goals, but reminds them that those plans must be “absolutely steeped in practical, day-to-day efforts,” with steps toward achieving success as far as one can envision.